Chairs, Benches and Chaise Loungers. After adding furniture to your cart, you then can order your cushions at the bottom of the respective furniture page. Deep Seating. All cushions are included with associated furniture. SPECIAL .... WOOD-JOY is currently offering about 200 colors at no additional charge, "no up charges". Most of our competitors only offer from 2-24 standard colors. Wood-Joy cushions have been specially designed to give an added touch of opulence and comfort to our seating and lounging products. 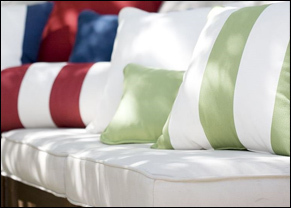 Cushions are tailored to fit each item of furniture and made from Sunbrella® 100% acrylic fabric. 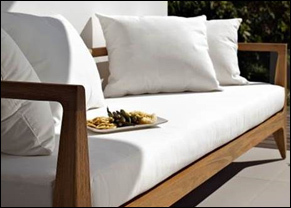 Fashionable, functional Sunbrella® is the perfect fabric for outdoor furniture. Developed from 30 years experience, Sunbrella® is made of durable, 100% solution dyed all-weather acrylic fabric. As a result Sunbrella® consistently feels soft and comfortable, retains its color and strength and withstands years of exposure to sunlight and rain. It also resists mildew, rot, chlorine and atmospheric chemicals and is easy to clean. We recommend inside storage during wet weather with standard cushions. Special DRYFAST fill may be a good decision if leaving exposed to the weather on a continual basis. This type of fill allows water to flow quickly through the entire cushion much faster than standard cushions. Call customer service for a special cushion quote on our DRYFAST fill cushions. Wipe clean all surfaces of new teak furniture, including the underside of tables with soapy water prior to using new cushions. This will help prevent natural teak oil from staining the fabric. How to clean new teak stains from cushion fabrics: Combine 1/4 cup dishwashing liquid per 1 gallon water and rinse thoroughly. Then use upholstery cleaner such as Resolve®. See the “Cleaning Sunbrella Cushions” link below for other types of stain removal and care. 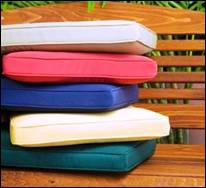 Chair, Benches and Chaise lounger Cushions are 2"-2 ½” thick solid foam with your choice of many Sunbrella colors. 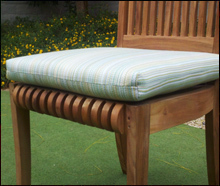 Optionally, you can order 4” thick cushions with Dacron wrap for Chaise Loungers (recommended for softness). You can also choose either Boxed (standard price) or Welted/Piped edges (minor upcharge). Deep Seat Cushions usually include 6” thick seats and 5” thick back (nominal dimensions) with your choice of many Sunbrella colors. Deep Seat cushions are overstuffed for added comfort. You can also choose either Boxed (standard price) or Welted/Piped edges (minor upcharge). 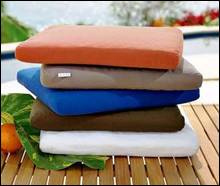 For replacement cushions or special order custom cushions call customer service at 888-449-7737.